What’s that even mean, you’re asking? Yeah, I didn’t know either. I made it thinking it was a fancy dish, but later found out it’s Italian for “Pasta with Eggplant.” Seriously? That sounded plain and boring, not to mention slightly awful. 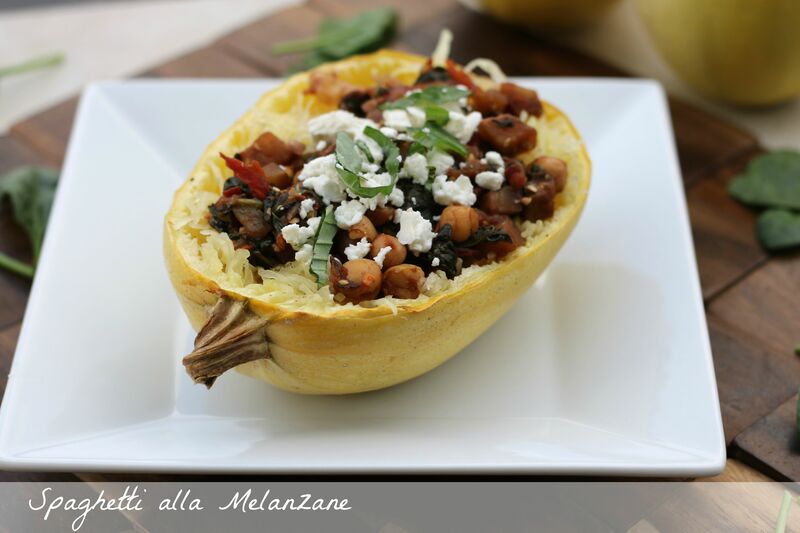 So I kept the alla melanzane to make it sound fancy. :) Just FYI, if you Google that, you’re going to come up with a page of all Italian. I was so confused. The translations are funny, though. This recipe is anything but plain or boring and is definitely not awful. It’s full of so much flavor from the fresh basil, balsamic vinegar, and red pepper flakes (it has a kick!). The chickpeas give you staying power with its protein and the eggplant and chickpeas add meatiness to a vegetarian dish. 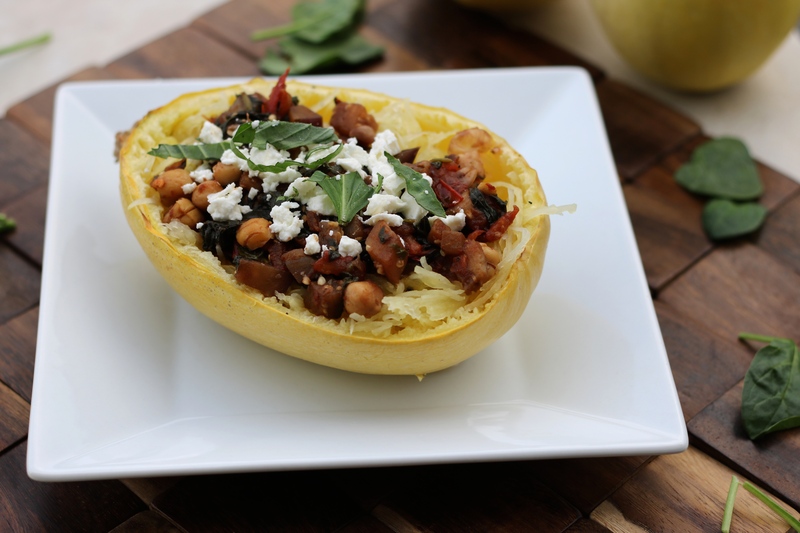 To top it all off, the feta cheese sprinkled on top of these cute spaghetti squash boats adds a coolness and tang to round out all the flavors. 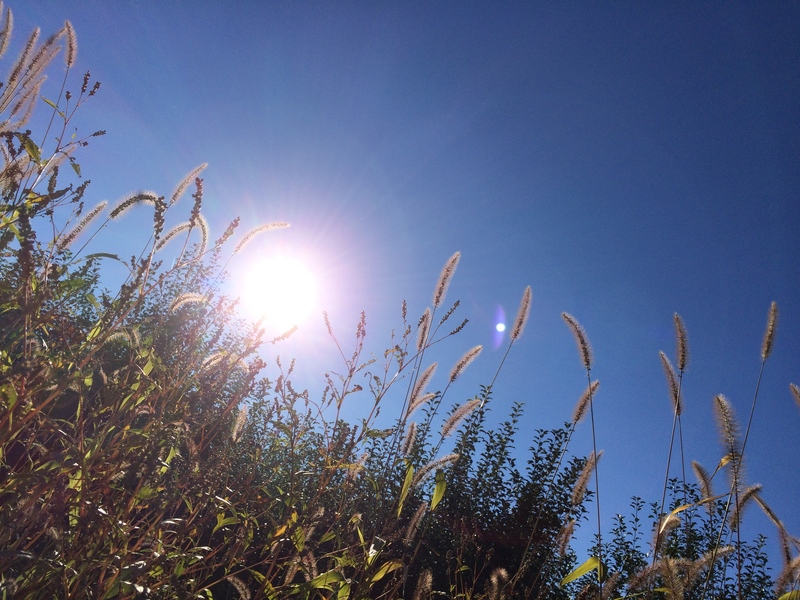 It’s light, yet filling. And it’s absolutely the perfect Meatless Monday kind of meal. Preheat oven to 400°. Cut squash in half, scoop out seeds, and place cut side up on a foil-lined baking sheet. Brush insides with olive oil and salt and pepper. Roast in preheated oven for ~30 minutes, depending on size of squash, or until tender is easily pierced with a fork. Let cool slightly. With fork, rake tongs back and forth to remove its flesh in strands. 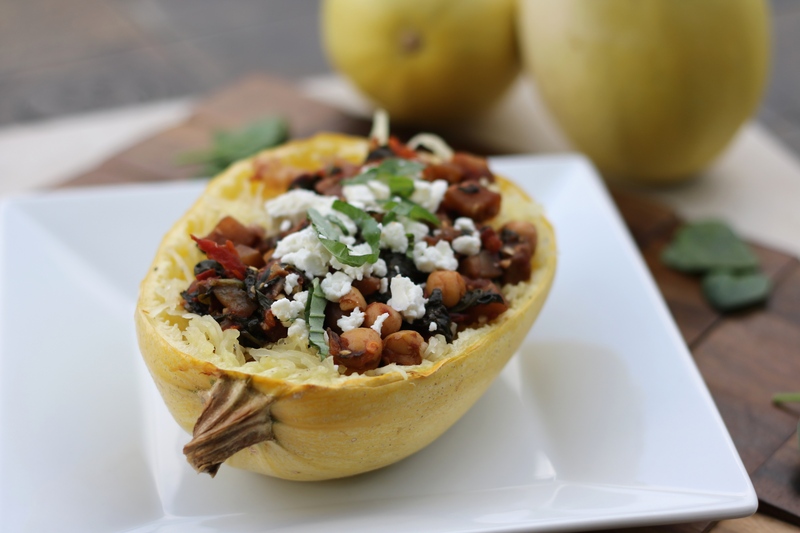 Keep the flesh in the squash for individual boats or take out the flesh and add to finished dish. Meanwhile, in a large bowl, combine chickpeas, eggplant, tomatoes and 1/2 cup basil. 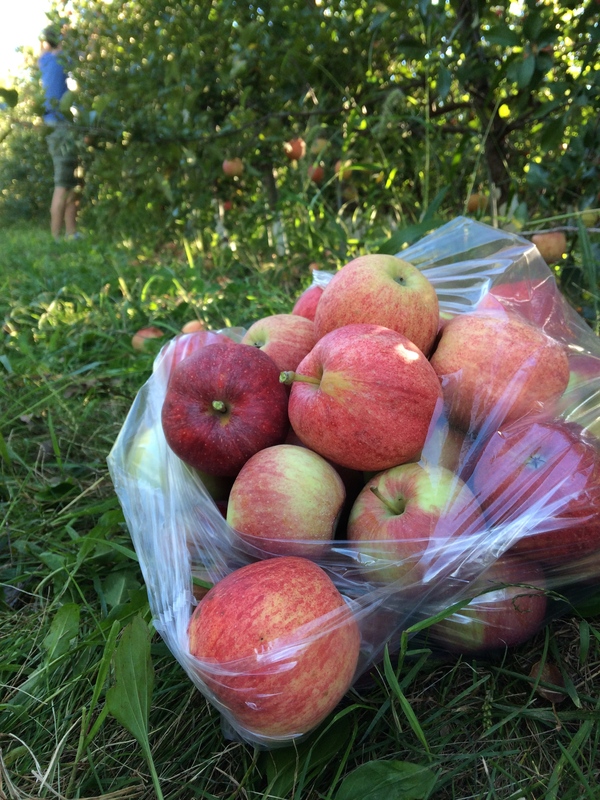 In a small bowl, whisk together vinegar, two tablespoons oil, honey, pepper flakes and black pepper. Pour over chickpea mixture and set aside to marinade for 20-30 minutes. While chickpea mixture is marinating, in a large skillet, heat remaining 2 teaspoons oil on medium-high. Sauté garlic for 1 to 2 minutes. Add spinach and sauté for 2 minutes. Reduce heat to medium and add chickpea mixture; cook for 10 minutes or until eggplant is softened. If needed, stir in about 1/4 cup of warm water. 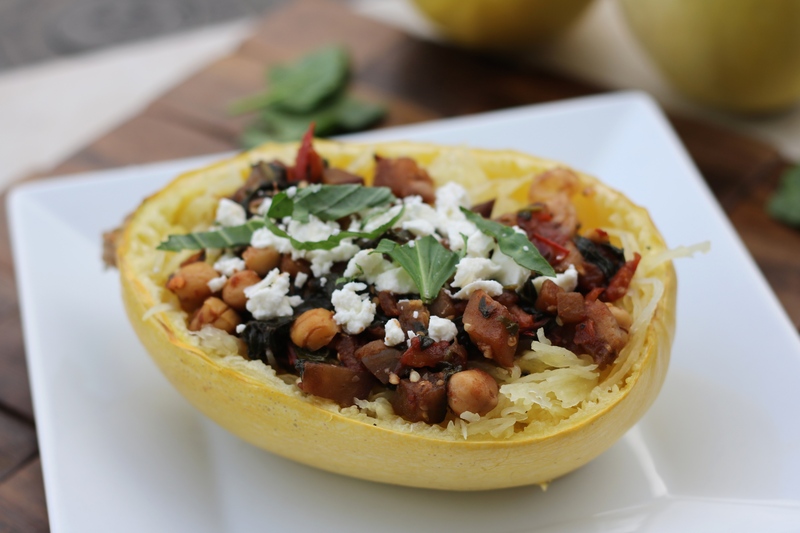 To make spaghetti squash boats, top squash with chickpea mixture, feta cheese, and the remaining basil. 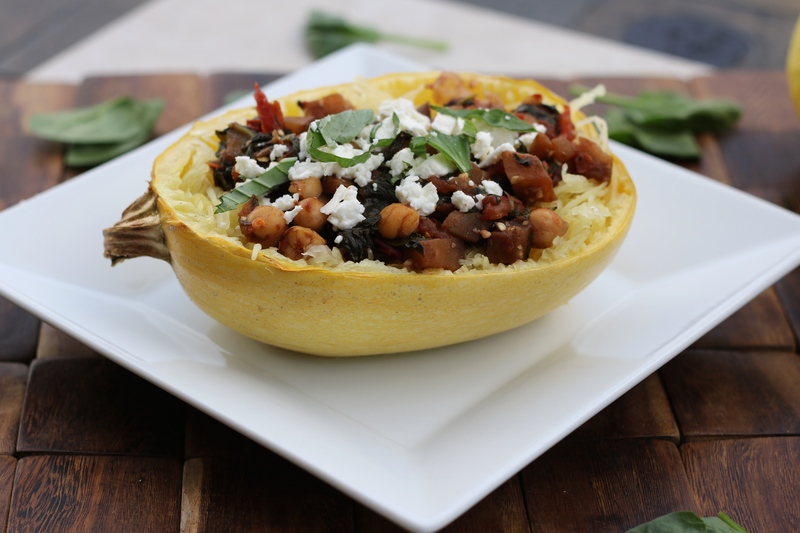 If you’re removing the flesh from the squash, add the squash and chickpea mixture to a large bowl. Stir in the feta cheese and top with the basil.